Product prices and availability are accurate as of 2019-04-21 05:18:27 UTC and are subject to change. Any price and availability information displayed on http://www.amazon.com/ at the time of purchase will apply to the purchase of this product. A must have! 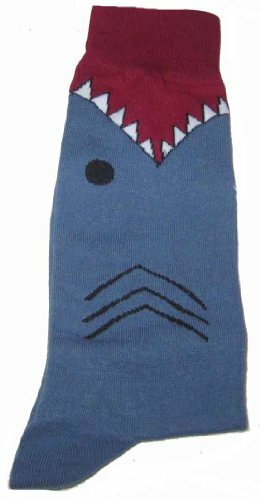 Buy K. Bell Men's Shark Socks easily online today. K. Bell Men's Shark Socks. The K.Bell Shark Socks in Slate Blue These sick shark print crew socks from K. Bell will drop jaws... get it? Drop JAWS. Anyways, work this finely crafted foot art with your favorite pair of Converse and get to style stepping. Mid-calf socks with graphic print Contrast heel, toe and trim One size fits all 60% cotton, 38% polyester, 2% spandex Imported By K. Bell. Manufactured by K. Bell. A brand-new, unused, and unworn item (including handmade items) in the original packaging (such as the original box or bag) and/or with the original tags attached.